When twenty-six-year-old Tara Chatterjee moves to Gurgaon to make a fresh start after a painful breakup, she finds herself in the middle of a peculiar situation. Her new home is inhabited by a ghost, a woman only she can see! Who is this woman and why does she keep appearing in front of Tara with her motley crew of friends? Will Tara be able to make sense of the chaos in her own life and unravel the secret of her haunted apartment? 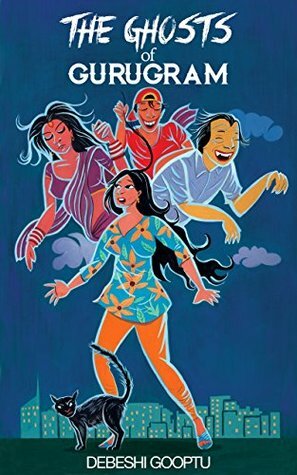 Insightful and moving with flashes of wit, the story takes a look at the darker side of Gurgaon’s development and the growing menace of suicide and dowry-related deaths in the Millennium City. The important aspect of this book was the writing. I love the way the author wrote the whole book – it was so easy to read however not letting go of an important message. incidents like dowry deaths, suicides, murders, and violence against women acts as a subplot to those book. In a high-tech modern city incident like this happens everyday but goes unnoticed. The author wanted to high light that in this book. The main character is Tara, 26-year-old is a new manager shifting to her company&apos;s Gurgaon office. She starts to search for a new home and after a lot of trouble she finally gets one. However trouble begins once she starts leaving there. She sees various delusional and illusionary things and objects which really makes the readers question whether those are real or illusion. The story of The Ghosts of Gurugram is crisp. The first incident which occur in the book after she got into the flat was a bit scary to me and I literally had goosebumps all over my body. Then another side if the story dealt with the whole shifting scenario from one city to another. Moving from a laid back Kolkata to a high-tech busy Gurugram can be challenging gor each one of us. But after sometime Tara did manage to stay all by herself and to continue with her life. She also had her own personal problems to deal with which was super relatable. The narration and the writing were beautiful and I could easy imagine the whole scene in front of me. I will highly recommend The Ghost of Gurugram to you all…. Please note – I received a copy from Writersmelon in exchange for an honest and unbiased review. Previous Post A Colour-changing Canopy.